It all started with a phone call from our daughter who had recently taken a job in Chicago. ‘Dad, you should see what we are doing at our church! You would love this. I wish you were here!’ She was talking about a food-packing event for Feed My Starving Children. FMSC is a Christian non-profit organization committed to feeding hungry children around the world. Her church was sponsoring a FMSC MobilePack, a program that connects local volunteers to starving children by packing food or donating funds. As stated at their website, The approach is simple: hand-packed meals specially formulated for malnourished children sent out to mission partners running orphanages, schools, clinics and feeding programs around the world. My daughter knows her daddy well, and as she continued to share her excitement about this program, she explained that one of the main ingredients in these MannaPack meals is soy. Well, that was all it took — my husband was in! You see, my guy is a farmer — of soybeans. And my guy is a giver — of anything God graciously gives him. He is one of the most generous men I know. So a program that feeds starving children, uses soybeans, and connects local people in a generous mission-type project was like a recipe made in heaven to him. 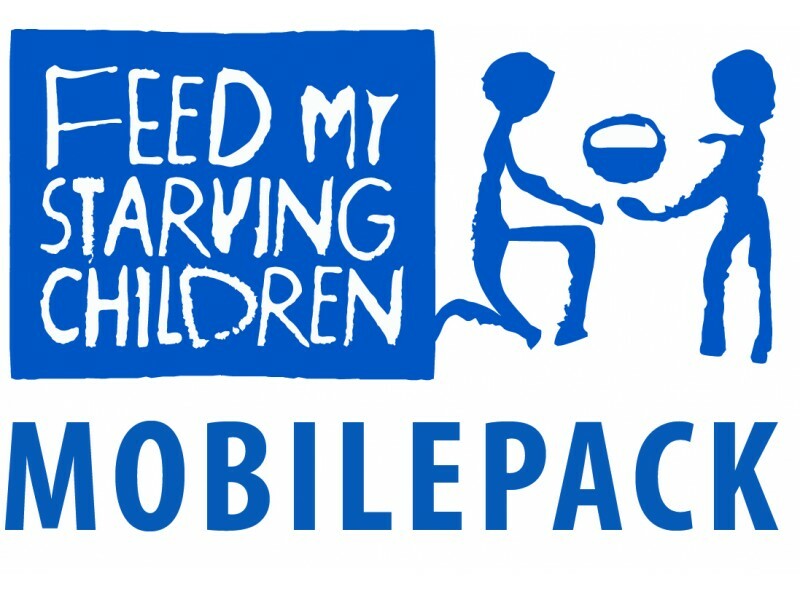 It only took a matter of weeks before he, his two farming partners, and a local pastor had a FMSC MobilePack scheduled for our area. A MobilePack in process — hair bonnets and all! Our small farming community raised over $44,000 and packed 205,000 meals that first year, using almost 1000 volunteers. One of the wonderful aspects of a FMSC MobilePack is the variety of “jobs” available to reach the goal. 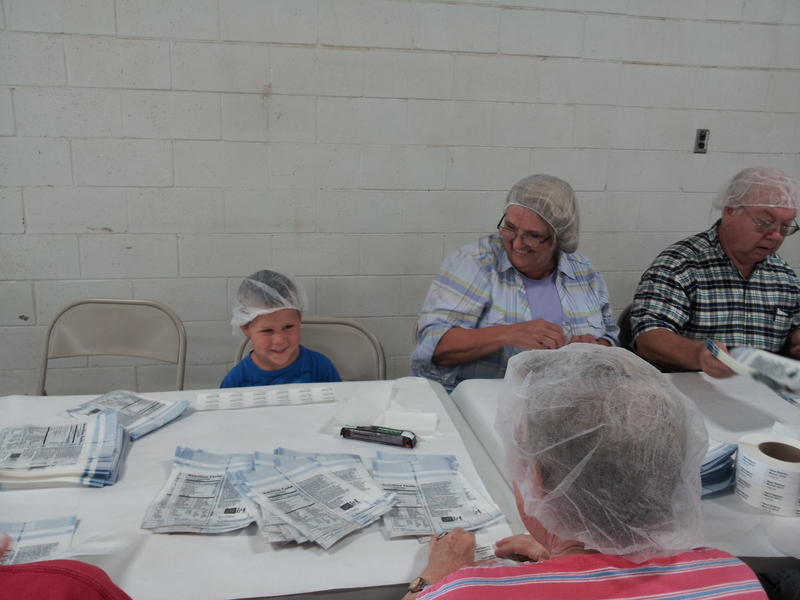 My 83 year-old mother sat at a table with her friends, putting labels on food baggies while my 5 year old grand-daughter stood at a packing table, stacking MannaPack meals with her Papa. It was an amazing event, and our community loved the opportunity to be involved. Not everyone can go to an orphanage on the other of side of the world to feed a starving child, but most of us have a couple of hours on a Saturday to help pack a few meals. It has now been almost 7 years since that phone call from our daughter. We are still packing meals every September for FMSC. The event has had its challenges and rewards. It has been a learning experience for all of us. Join me here as I share some of those stories and take you along on the adventure as our community provides Meals From Michiana. 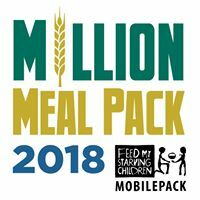 If you’d like to donate to our community MoiblePack, go to: fundraising.fmsc.org/Michiana. (If you do so, I would love for you to leave a short comment here).